Few workplace floors take more of a beating than at an automotive repair shop. Prestige Floor Coating has an advanced polymer system that turns your ho-hum concrete garage floor into a stylish, durable, and low-maintenance floor. With professional floor coating services, your auto shop will look better to customers and your mechanics will love having a cleaner, stronger floor. Find out how we can provide a long-lasting solution for automotive shop floor coatings! To schedule a free estimate for auto shop flooring services, call or contact us today! Our auto shop floor coating holds up to the humidity and temperature swings of the Maryland area. Even the heavy weight, oil spills, and cleaning chemicals won’t crack or peel your coated floor. The result is an easier to clean auto shop floor that lasts many years longer than the alternatives. To schedule floor coating services for your auto shop? Contact us today! Our floor coating seeks out moisture in the concrete to create a molecular bond. The result is a new surface that is 600% elastic (to prevent cracking) and much easier to keep clean. It’s essentially a rubberized membrane that’s harder and stronger than plain concrete. Give your shop a stylish makeover that makes customers feel good about bringing in their car, while also giving your employees a better work environment with easier cleaning. 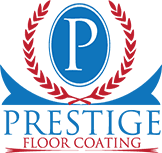 Prestige Floor Coating comes in numerous color options, with customizable levels of texture and anti-skid levels. If you have a professional garage, collision center, oil change shop, or other automotive shop in Maryland, Virginia, Pennsylvania, or Delaware, get in touch with us at Prestige Floor Coating. Call or request a free estimate online for auto shop floor coatings!